WinArcher is the PUP that uses misleading techniques to prevent removal. Use Reimage to locate malicious components and get rid of them faster than with uninstall instructions. A full system scan blocks virus reappearance and prevents traffic to malicious domains. What is WinArcher program doing in my computer? How did I get infected with adware? How to remove WinArcher adware? WinArcher virus is not a malware-type software; however, its existence on your PC is not a good sign, either. The only reason why we mentioned the word “virus” is that computer users tend to call WinArcher this way after discovering it on the computer system. Once installed, this questionable piece of software starts digging the system for certain information, for example, IP address, installed software, search queries and search history related data, and then transmits such information to an adware distribution network. The software is not analyzed precisely yet, so we cannot provide more details about it. One thing is for sure – it works as a data collector, and currently it is unknown where such data is going to be used. Therefore, it is highly recommended to remove WinArcher PUP from the system without any hesitations. We doubt that you need such component in your PC, especially because it lacks beneficial features. Researcher shows how the main Winarcher file looks like. We assume that collected data might be used to deliver targeted advertising to the victim. Typically, adware programs collect information related to user’s browsing and use it to select individual ads for each victim. 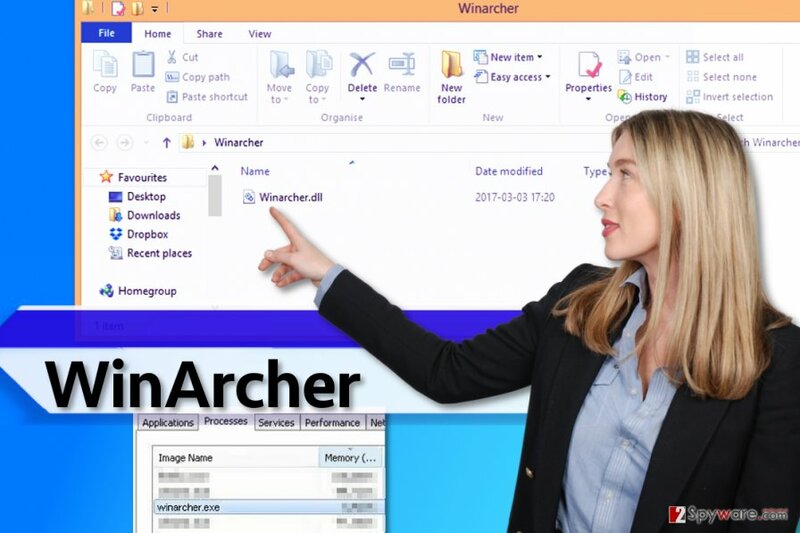 If you use a computer that is contaminated with some kind of adware, then WinArcher file is likely to be installed as well, and it is known to be responsible for data transmission between your PC and adware distribution network. It is advisable to take care of WinArcher removal in time otherwise, your computer might start working slowly, and the quality of your browsing experience might go down as well. For WinArcher removal, we suggest using anti-spyware programs that can precisely delete all spyware-related files from the computer system. We recommend using Reimage or Plumbytes Anti-MalwareMalwarebytes Malwarebytes software. Adware spreads via software bundles (in most cases). You can also install adware programs if you tend to browse the Internet carelessly – it is easy to install an ad-supported program because the majority of free programs available online are ad-supported. We suggest reading comments online about computer programs before installing them on your PC. If you are looking for ways to avoid ad-supported programs, never install your downloads using Default/Standard settings because they typically contain a few statements saying that you agree to install suggested third-party applications or browser toolbars. These additional programs usually appear to be adware or browser hijacker-type programs, and it is better to keep your PC free of them. To drop these additional items off, just choose Custom or Advanced installation option and deselect suggested third-party applications manually. Finish the installation and enjoy your new program, but make sure it doesn’t send you annoying pop-up advertisements as links integrated into them can cause danger to your PC! If you want to remove WinArcher, Archer.dll and other adware-related files successfully, you have to find a program that is related to it. It can be hard to understand which program brought this file into your PC system; therefore, we suggest using automatic spyware removal tool for this task. It can quickly complete WinArcher removal and save you tons of time. If you do not have an anti-spyware or anti-malware program yet, consider trying one of the programs that our team recommends using. You can find a list of them below, and you can read their reviews on our Software page. First of all, read this guide attentively. Your first task is to find questionable programs on the computer system and delete them one after another via Control panel. Here, look for WinArcher or any other recently installed suspicious programs. Wait until you see Applications folder and look for WinArcher or any other suspicious programs on it. Now right click on every of such entries and select Move to Trash. When in the new window, check Delete personal settings and select Reset again to complete WinArcher removal. Once these steps are finished, WinArcher should be removed from your Microsoft Edge browser. Firefox is vulnerable to adware programs and can be easily taken under their control. This tutorial will explain you how to remove WinArcher PUP and related components from your Firefox browser. Here, select WinArcher and other questionable plugins. Click Remove to delete these entries. Now you will see Reset Firefox to its default state message with Reset Firefox button. Click this button for several times and complete WinArcher removal. Remove all suspicious extensions from Chrome and change settings that were modified. This tutorial explains what should you do. Follow these instructions carefully and you will remove WinArcher by yourself. Here, select WinArcher and other malicious plugins and select trash icon to delete these entries. Click Reset to confirm this action and complete WinArcher removal. Here, select Extensions and look for WinArcher or other suspicious entries. Click on the Uninstall button to get rid each of them. Now you will see a detailed dialog window filled with reset options. All of those options are usually checked, but you can specify which of them you want to reset. Click the Reset button to complete WinArcher removal process. ^ Information about malware and removal instructions. NoVirus. Malware removal guides. ^ Stephanie Crawford. What is an IP address?. HowStuffWorks Computer. Gets you explanations, reviews, opinions and prices for the Internet, home networking, hardware, and software. ^ Katherine Noyes. Adware turns a tidy profit for those who sneak it into downloads. PCWorld. News, tips and reviews from the experts on PCs, Windows and more. ^ Software review. Wikipedia. The Free Encyclopedia. This entry was posted on 2017-03-06 at 02:21 and is filed under Adware, Viruses. You can quickly scan the QR code with your mobile device and have WinArcher virus manual removal instructions right in your pocket. How did you remove WinArcher virus?